Pesto is incredibly easy to make and lasts over a week in your refrigerator. You do, however, need a food processor. 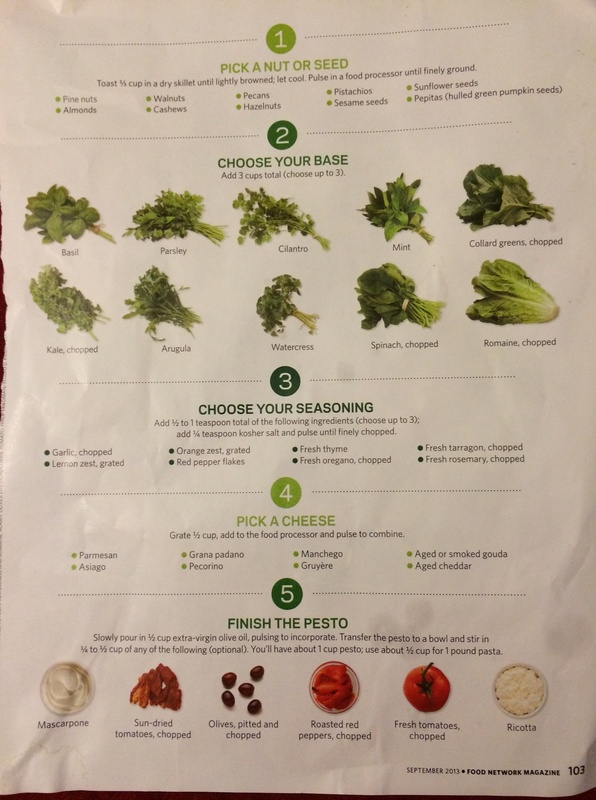 I’ve put together my pesto guide that I adhere to, acquired by Food Network. You can vary you’re ingredients to your liking with this simple step by step guide. This guide makes 1 cup of pesto. CHOOSE YOUR SEASONING(choose 3). Add 1/2 – 1 tsp of your desired ingredients to processor. PRESTO PESTO. Slowly pour 1/2 cup of olive oil, pulsing to incorporate. Add 1/2 cup of the following tomatoes *optional. I looove sundried tomatoes in mine. This recipe makes about 1 cup of pesto. **TIP: freeze your pesto in an ice cube tray for up to 3 months. Add to a hot pan (allow it to melt, do not cook it) with pasta for a 10 minute meal.